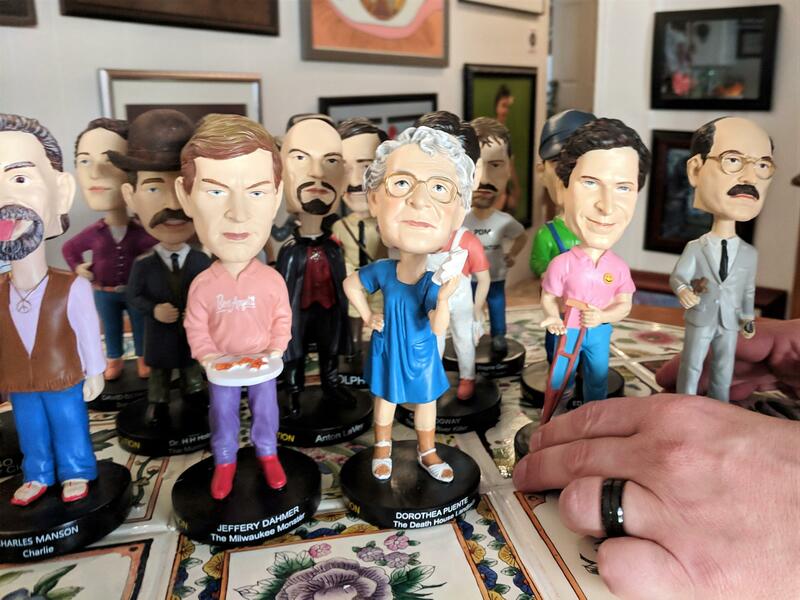 In December, San Joaquin Valley entrepreneur William Harder launched his fourth website: an online store selling bobbleheads of notorious serial killers. The frenetic energy of William Harder’s life is palpable before you even enter his home—with his dogs, their little heads crowding the front window to shout at visitors. Inside, Harder himself joins in, singing “Oh no!” in harmony with their excited cries. At the Ouija board welcome mat—I'll learn later it matches the kitchen mugs—Harder asks me to take off my shoes, offers me coffee, then hurries into a back room to tie up loose ends from the four online stores he maintains. Soon thereafter, he’ll realize he’s made it to 4 p.m. without a meal and will fix himself a bowl of Cap’n Crunch. In addition to art and personal letters from Charles Manson, Harder also owns many of his photos and crime records. Harder has a fascination with serial killers, particularly why they do what they do. He visited Manson regularly in prison, and over the span of a decade they built up a kind of trust. Manson wrote letters and sent artwork, much of which is now on Harder’s wall. “There's several string arts, there's two dolls, the earrings were beaded by Manson,” he says, then points to strings from a guitar Manson used to play and a letter he wrote to Harder and his wife. 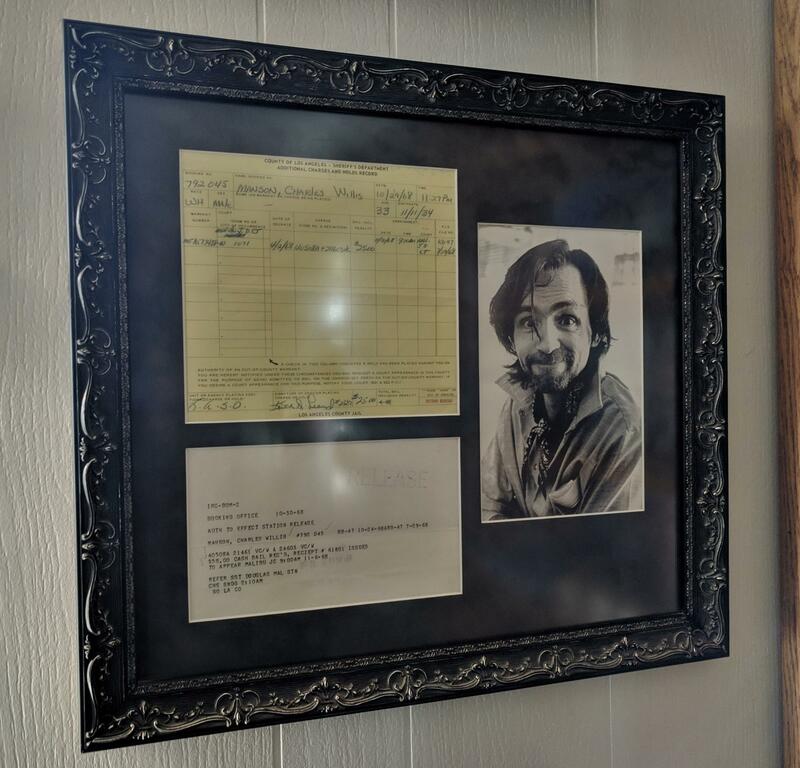 Over time, Harder has come to be a collector of murder memorabilia, or what some refer to as “murderabilia.” And not just from Manson—in a display case, next to a Satanic Bible and a preserved slice of a human brain, Harder points to a little orange bottle. “I have a Dr. Jack Kevorkian, one of his old prescription bottles for his blood pressure medication,” he says. On another wall, there's a childlike, colorful painting. “That's an actual John Wayne Gacy, Pogo the clown,” he says. Gacy dressed as Pogo to lure his victims. 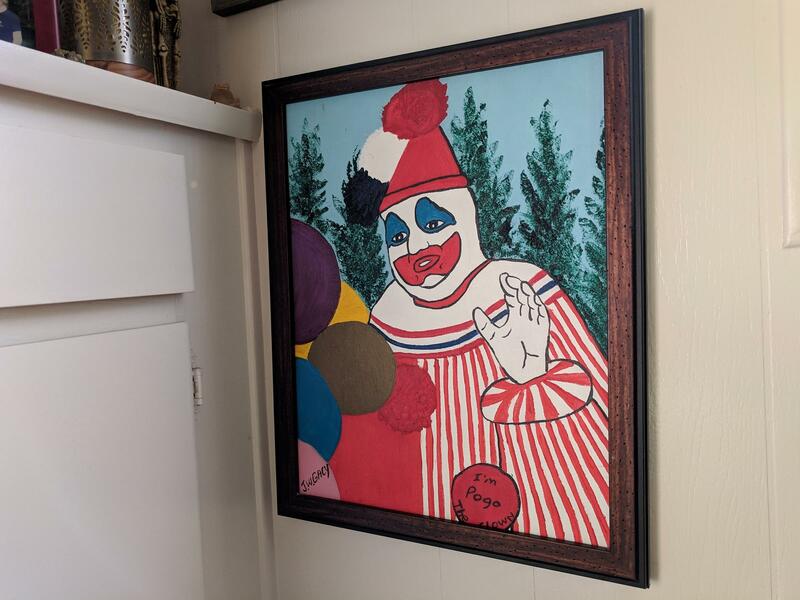 Original paintings like this one by John Wayne Gacy fetch thousands of dollars on online auction sites. Harder doesn’t just collect this stuff, he also deals in it: From his home, he runs an e-commerce site called Murder Auction—kind of like eBay, but for things related to, well, murders. It’s one of a handful of sites that sell clothing and letters and even fingernail clippings from murderers and victims. Harder says he doesn’t sell his personal collection. This all led him to his newest venture. 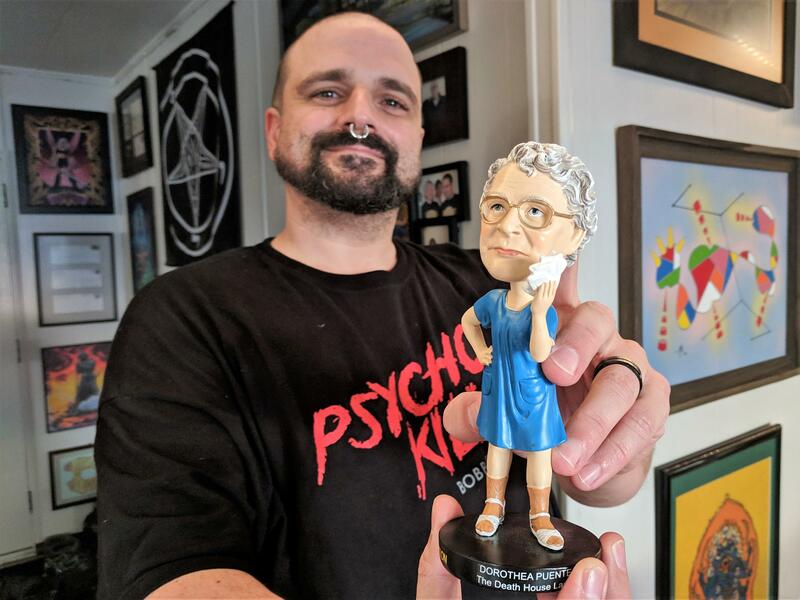 “So I got an email from this guy saying ‘hey, I'd like to make serial killer bobbleheads, I mean I think it'd be a great thing,’ and I'm like ‘yeah, that sounds like a great idea,’” he says. Harder visited dozens of convicted killers in prison, including Dorothea Puente, who was convicted of killing tenants in a Sacramento boarding house in order to cash their social security checks. In that same show, he sparred with Andy Kahan, a victim’s advocate with Crime Stoppers in Houston, Texas. “Their loved one didn’t die so you could profit from selling personalized items,” Kahan said. “But everybody does, whether it’s books, documentaries, stuff like this,” Harder responded. Kahan asserted there’s a big difference, and that true crime writers tend to piece together only what’s publicly available from police and court records. “Big difference? It’s the same,” said Harder. In drawing a straight line between murder memorabilia and true crime, Harder turns this into a business ethics discussion. If an industry exists, who’s more at fault: The suppliers of the product, or the customers clamoring for it? In the early 2000s, Kahan’s lobbying led eBay to ban murder memorabilia and other items related to violent felons. One could argue that’s what led to independent sites like Murder Auction popping up. 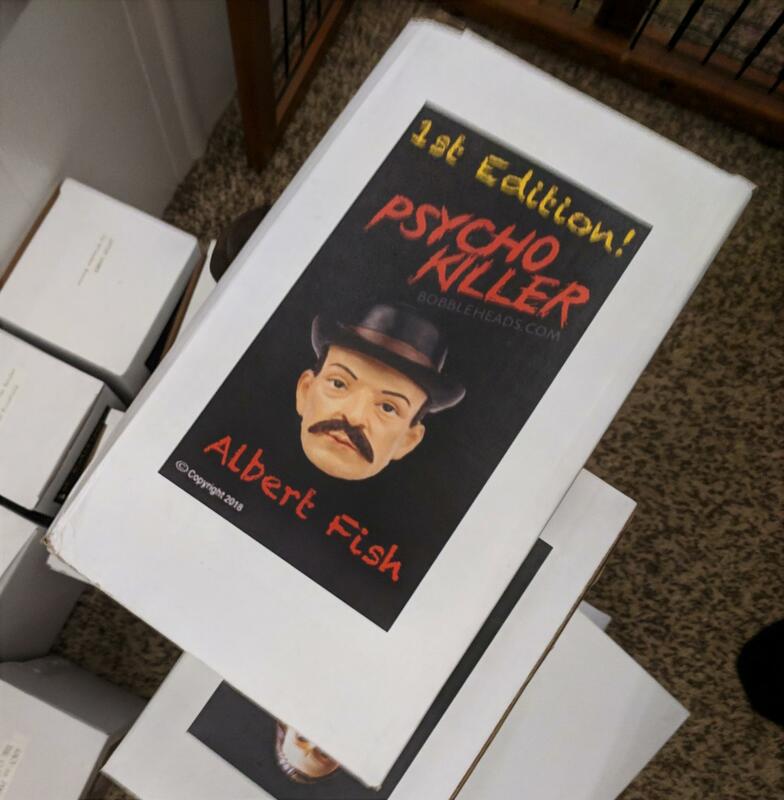 The first edition of Psycho Killer Bobbleheads consists of 300 orders of each of 16 notorious serial killers. But this industry didn’t just emerge in the internet era. One of the earliest documented cases occurred almost two centuries ago. “There was a famous case in the 1800s, a murderer called William Corder,” says Jack Denham, a criminologist with York St. John University in the UK who will soon be publishing a book on murder memorabilia. In 1827, Corder shot and killed his lover in a barn, and was hanged for it a year later. “People would sell fragments of the barn, and also would turn his murder into a stage production and a theatre production that toured around the United States,” Denham says. Later, people would attend public executions in droves. Harder packages and ships the bobbleheads from his home, where he runs all four of the websites he maintains. In late January, the streaming service Netflix debuted a docuseries about serial killer Ted Bundy. A few days later, enough people had tweeted about Bundy’s “hotness” that the service was compelled to urge its viewers to stop sexualizing him. Plenty of people, he says, as he prepares five more bobbleheads to be shipped. He launched the site in December, and he estimates he’s sold at least 70 already.